Last month we stated, “We expect the consumer to fall next.” According to the New York Times article ‘Americans Cut Back on Spending’, “The abrupt pullback raises the possibility that the country may be experiencing a rare decline in personal consumption, not just a slower rate of growth.” As you can see from the chart below, consumers are increasingly falling behind on their debts. As Bloomberg reports; “The fourth quarter may be the worst earnings period for the financial industry since the Great Depression.” Housing and banking are in a ‘Great Depression.’ American consumers will be there shortly without bank credit based on inflated real estate prices. According to the Federal Reserve Board website, U.S. non-borrowed bank reserves have gone from $37B to $199M (nope, that’s not a typo) in the last month. We have been discussing this with Sitka Pacific Capital’s Mike ‘Mish’ Shedlock for the last two weeks. He concludes: “Banks in aggregate have now burnt through all of their capital and are forced to borrow reserves from the Fed in order to keep lending.” Simply put, the U.S. banking system has no reserves. In addition, the FDIC has recently begun modernizing large-bank insurance rules. We hope this is a wake-up call to everyone as to the extent of the credit crisis. Bank account balances should be used only for transactions. Instead, cash should be held in U.S. Treasury Bills at a conservative brokerage or trust. Under the mattress is also perfectly acceptable (your parents or grandparents had to do it!). As investors, we advised last year to sell the banks. Banks will be soon forced to sell assets at deeply discounted prices to pay depositors. While the Fed is ‘printing money’ for bank reserves, politicians are pledging tax breaks for consumers. But you can’t cure the problem of too much spending with more spending. Consumers will now use any free cash to pay off their debts. Any fiscal stimulus ultimately ends up being hoarded at the financial institutions (and used to pay back the Fed!). This is the liquidity trap that Japan fell into in 1990. Note that massive fiscal stimulus in Japan proved unsuccessful in reviving their economy as well. Fed Cuts - But the Market Wants More! As the chart from Elliotwave.com states, the Fed follows the 3 month U.S. Treasury Bill. As investors flock to cash, the Fed is forced to cut rates. The 3 month U.S. Treasury Bill Yield has fallen as expected. Its yield is about 2.2%. According to Bankrate.com, for a homeowner to apply for a home equity loan they must have an 80% loan-to-value ratio. So despite the Fed rate cuts, folks that are highly in debt (or in a house that has fallen in price) are unable to refinance. A new website, Youwalkaway.com, is now offering guidance to homeowners on walking away from their home. This of course means more losses in the banking system. Watch the CBS video from ‘60 Minutes’ to see a very good description of what is transpiring on the ground in California. In Florida, “According to Fort Myers MLS Board figures, it would take 44.5 months – nearly four years – to work off the current inventory of homes for sale.” ForeclosureRadar.com, mentioned in the CBS video, shows that banks are holding foreclosed properties off the market. This is because even at ‘deeply discounted prices’ only a few are are selling. Further home price declines should be expected. How Long Does A Bust Take? During the period from 1980-2000, Gold experienced a bear market. 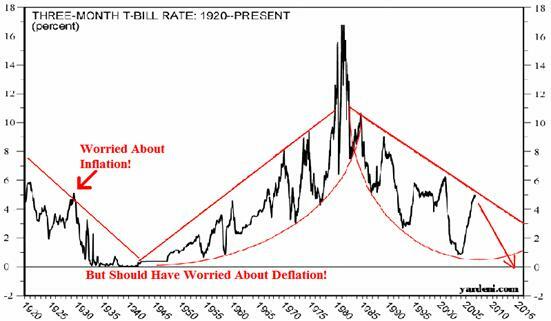 As you can see from the chart below after the parabolic rise that ended in 1980, the gold price fell for 20 years. 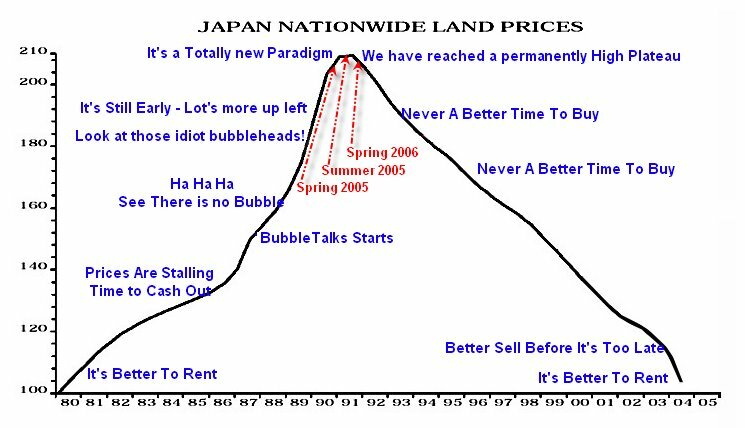 Similarly, Japanese real estate prices topped out 16 years ago. As the chart below (from Mish’s Global Trend Analysis) states “never a better time to buy” is the theme of a falling market. Compare this to our recent boom in U.S. home values in the chart from Yale economist Robert Shiller. The price of U.S. real estate could correct significantly for 20 years. The alternate scenario is that banking failures force the price of real estate to fall dramatically, creating an 85-90% correction within only a few years (like the NASDAQ stocks of 2000-2003). Simply put, there are only a few players at the poker table that insures against bond defaults. Players win at the expense of others. But winners are ultimately unable to collect because the losses are so big that they put the loser (such as ACA Capital) out of business. According to Bloomberg, there are $45 Trillion in credit default swaps. That is an amount that is three times U.S. GDP. You would be correct to assume that the mad scientists have taken over Wall Street. FT.com reveals that the monster is now uncontrollable; “a boom in the use of derivatives is giving creditors strong incentives to push troubled companies into bankruptcy rather than help rescue them.” This will backfire for the reason before stated. There will be no winners at this table. Bill Gross estimates losses of $250B will be created by credit derivatives. Wall Street firms will need more cash to feed their beast and will be unable to fulfill their proper role of lending in this credit based economy. Market analysts have dubbed Google, Apple, Research in Motion and Amazon the Four Horsemen of technology. With P/E ratios of 51, 45, 51 and 95, the Four Horsemen signal another apocalypse for tech investors. That ninety-five isn’t a typo either. A buyer of Amazon.com is willing to pay a 95 year premium of 2006 corporate earnings. Now that’s long term investing! When a person runs with the investment herd, they judge their actions based on participants around them. In a stampede for paper profits, the whole herd is eventually lured off the cliff. A contrarian investor removes himself/herself from the herd, observes the whole stampede from afar, and is therefore able to avoid the eventual demise of the trend. Currently, the herd believes the Fed, U.S. Government, or private insurers will bail out the financial system. We believe this is a false hope. We do expect more ‘money printing’ and schemes from politicians that will attempt to re-inflate the credit bubble. This is precisely what Hoover attempted to do from 1929 to 1933. As then, manipulation cannot overcome market forces. A stock market bottom occurred with a 500 point panic plunge on Jan. 22nd. The herd panicked at the bottom as usual, so we have expected a rally in the near term. Will the DJIA go to new highs? We don’t know. In our view, the reward gained by participating in this bounce is not enough to compensate for significant downside risk. As Jim Rogers recommends in a recent CNBC video, ”we could have a big rally, but you’d better sell that rally.” At the end of the 60 year credit cycle stocks historically fall 40-85%.